12ft Natural Horsemanship Rope / Communication Training Line. Parelli Style 3.6m / 12ft Communication Line is made from High Quality Yachting Braid that is Smooth, Flexible and Resistant to Sweat. 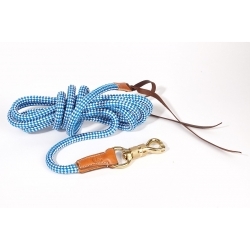 The Rope is Ideal for Natural Horsemanship / Parelli Training. In natural horsemanship, it's very important to have a rope that conveys life and energy so you can communicate clearly through it. This line has a sturdy brass swivel snap that prevents the rope from twisting and improves feel. Once you've built respect on the 12-foot Line, the challenge needs to extend to a 22ft rope. You'll build up to the full 22 feet as you become better able to keep control and more effective in your communication on the 12ft line.